When I first started carrying a gun regularly, I was of the opinion that if it wasn't a .45 ACP, it was crap. Only idiots would carry a 9mm when such a thing as the .45 ACP was available. "Big heavy bullets let in a lot of air and let out a lot of blood" is a quote that I think comes from Elmer Keith, and I lived it. And why carry anything other than a single action 1911? The trigger design of John Browning's biggest success provides the shortest, lightest, crispest trigger pull of any other pistol on the market designed for self-defense. Well&apos;¦.I'm a lot older now. 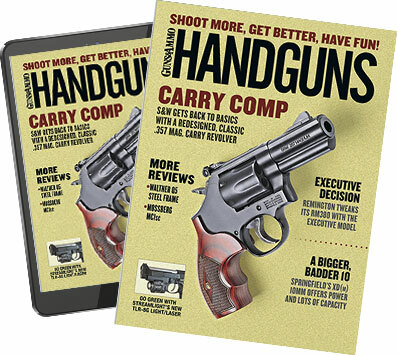 While I still believe that the .45 ACP sets the handgun cartridge self-defense performance standard against which all others should be judged, and the single action 1911 trigger is the easiest to shoot fast and accurately, I have realized that bullet placement is much more important than caliber, and the gun you have on you is the best one in the world if something happens. My moderated position on carry guns has been recently reinforced by two events in the media. The first occurred in early July when two thugs, one armed with a pistol, the other with a baseball bat, entered an internet café in Florida with the attempt to rob the patrons. 71-year-old Samuel Williams was there with his wife, and as soon as the wildly waving gun of the one perpetrator was not pointing at him, Williams drew what is reported as being a .380 semi-auto, advanced, and started shooting. Say what you want about the lack of stopping power of the .380, I consider his pistol to have effectively stopped two criminals with one shot, because as soon as Williams fired the first shot both the armed robbers realized they had urgent business elsewhere and fell over each other running out of there. The second incident was the tragic Aurora, Colorado, movie theater mass shooting. If even one theater patron had been armed with even a .22 short, the body count may have been much lower. We'll never know. Any gun, as long as it is reliable, is a good gun to have on you. I know many shooters and gun writers who are very snobby when it comes to inexpensive guns, but my opinion is that as long as "Brand X" is reliable, every other concern is secondary. A lot of people carry inexpensive guns, and inexpensive guns have saved a lot of lives. I just had an opportunity to test a C-100, imported by TriStar Arms from Turkey. This is an inexpensive compact CZ-75 clone with a 13+1 capacity in 9mm. What's the most (and perhaps only) important question?—was it reliable. Yes. The gun was completely reliable, reasonably accurate and comfortable to shoot, and I could end this article right here and fill the remaining space with pictures just so you know what it looks like, because once shooters get past the reliability issue, looks become important, as do features such as specific sights, magazine capacity, safeties, etc. For those of you still reading, here's the lowdown on the C-100. This pistol is based on the proven CZ-75 design. It seems like every European gun manufacturer makes a CZ-75 clone. If this seems weird to you, remember that we have the same thing going on in this country with the 1911. The full-size original CZ-75 had a 15+1 capacity and a 4 3/4-inch barrel. The C-100 is a compact version of that design with a 13+1 capacity and a 3.9" barrel. Reportedly it has a steel alloy frame, but it feels so light I had to double-check with the manufacturer that it didn't have an aluminum frame. With the top end off the frame only weighs 9 ounces. The whole gun empty tips the scales at 23 ounces. The CZ design has stayed popular because of the very comfortable grip, and the fact that it has such a low bore that it's comfortable to shoot. Not only that, the pistol has a manual safety which allows the pistol to be carried cocked and locked—chamber loaded, hammer back, safety on, just like a 1911. The thumb safety of the C-100 was stiff and small enough that deactivating it under stress might be a bit iffy, but the beauty of the CZ design is that it is a DA/SA auto, and those of you who prefer a double-action first shot over carrying a gun with a cocked hammer can do so. Trigger pull was heavy—12 pounds double action and 4 3/4 lbs single action. The DA trigger pull is not long, and breaks a little sooner than you're expecting, but if you have small hands the reach to the trigger might be a bit of a stretch. The trigger is wide and serrated. The frame of the C-100 is long enough for most people to get their whole hand on the gun. I don't consider this a pocket gun by any means, but rather a medium to small belt gun. The grips are checkered black plastic. Because it has a large grip, and a low bore, the C-100 is comfortable to shoot even with full-power ammunition. The top of the slide is serrated, and the pistol comes with 3-dot sights. The dots were light green instead of white, and on a hunch I hit the dots with a flashlight and then headed into a windowless room—yep, they were luminous paint, and glow for a while (pretty brightly) after being hit with bright light. The matte chroming on the slide of my pistol was functional, but not that pretty, but the frame was very cleanly made with no marks on the outside and minimal machining marks inside. The C-100 is supplied with two magazines made by Mec-Gar. Mec-Gar makes magazines for more gun companies than you would believe, they are a huge OEM supplier to major gun companies, so I wasn't surprised when they were reliable. The C-100 takes standard Compact CZ magazines so you shouldn't have trouble tracking more down. TriStar offers three versions of the C-100: an all blued version, an all-hardchromed version, and a two-tone model (which is what I had). MSRPs range from $429 to $449, which means you'll probably see them for sale under $400. Not a bad deal at all for a proven, reliable design. Accuracy results are the averages of four five-shot groups at 25 yards from a sandbag rest. Velocities are averages of 10 shots measured with an Oehler Model 35P chronograph 12 feet from the muzzle.